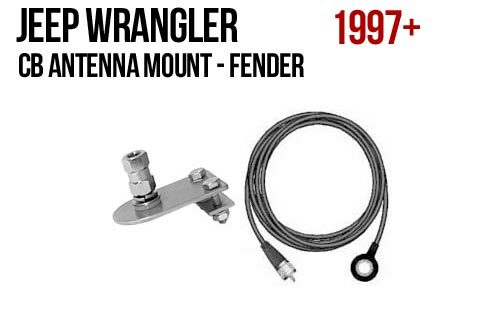 This mini-kit was specifically designed for the 1997 and newer Jeep Wranglers. The mounting bracket attaches to the front fender lip under the vehicles hood (either left or right side). Through testing we have found that having the antenna in front of the driver is a better option than the popular bumper type mounts. 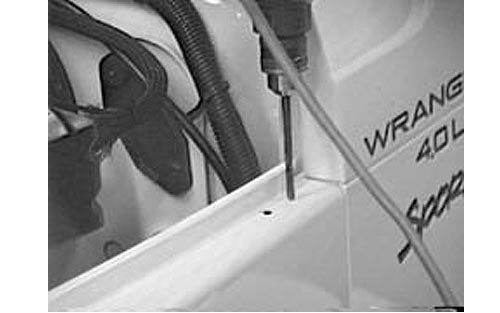 With the mount in front the driver has constant visual contact with the antenna. There is nothing worse than breaking your antenna in the middle of a trail run because you were unable to see that it was getting into trouble. You've heard it before ... out of sight ... out of mind. We also prefer to have the antenna on the drivers side of the vehicle as most obstructions will be found hanging over the outer edges of the roads or trails. If the vehicle is being used over severe terrain, the mount should be moved forward (closer to the fender bolt) for added stability. 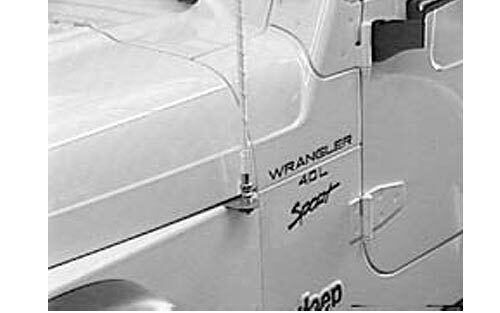 The design of the Jeep fender leaves a large portion of the fender unsupported near the windshield. All of the stainless steel mounting hardware (supplied)is hidden under the hood. The bracket is 2" (51mm) wide by 3" (76mm) long. The kit includes a stainless steel mount, 18 ft (5.5m) of professional grade Fire-Flex coaxial cable, and a FREE microphone hanger. 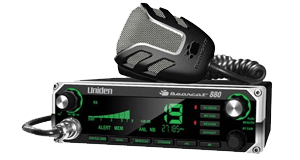 Why buy the mini-kit instead of individual components� The mini-kit uses our exclusive, rugged, weatherproof FireRing coax connection at the mount and costs less than individual component purchasing. Note: The rearward part of the fender on newer Jeeps does not have the same support that was found in earlier models. 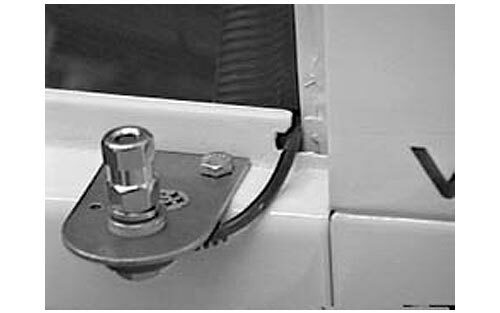 On these vehicles we recommend that the bracket be mounted at least 8-inches (20cm) forward of the rear edge of the fender where it has sufficient support. 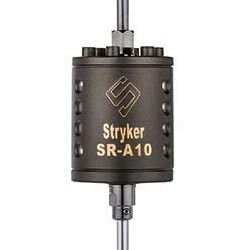 If this is not followed, or if the rear part of the fender is not given additional support, the fender, dependent upon the antenna size, will flex from any whipping action of the antenna. See the revised installation pictures by clicking on the link in the first paragraph.